Laserablation and cathode sputtering are especially suited for the preparation of multicomponent and oxidic compounds. Both methods allow to deposit thin films and heterostructure of complicated stoichiometry in a reactive atmosphere from a single target. Cathode sputtering uses an electrical gas discharge to remove target atoms from the target surface. They diffuse to the substrate where a continuous deposition takes place. For the Laser ablation a short high energy laser pulse (1 J /20ns) hits periodically the target and removes a thin surface layer that expands as a plasma to the substrate. Epitaxial growth is supported by single crystalline substrates of suitable lattice parameters and surface symmetrie. This allows to adjust the orientation of the single crystalline layer. 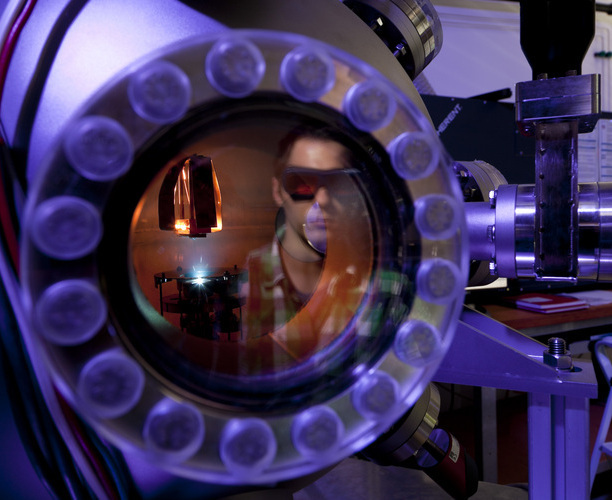 For Laserablation one laser serves to an UHV metal deposition chamber and a chamber for oxide materials. Several cathode sputtering chambers are in use in our group for oxide and metal films, respectively.